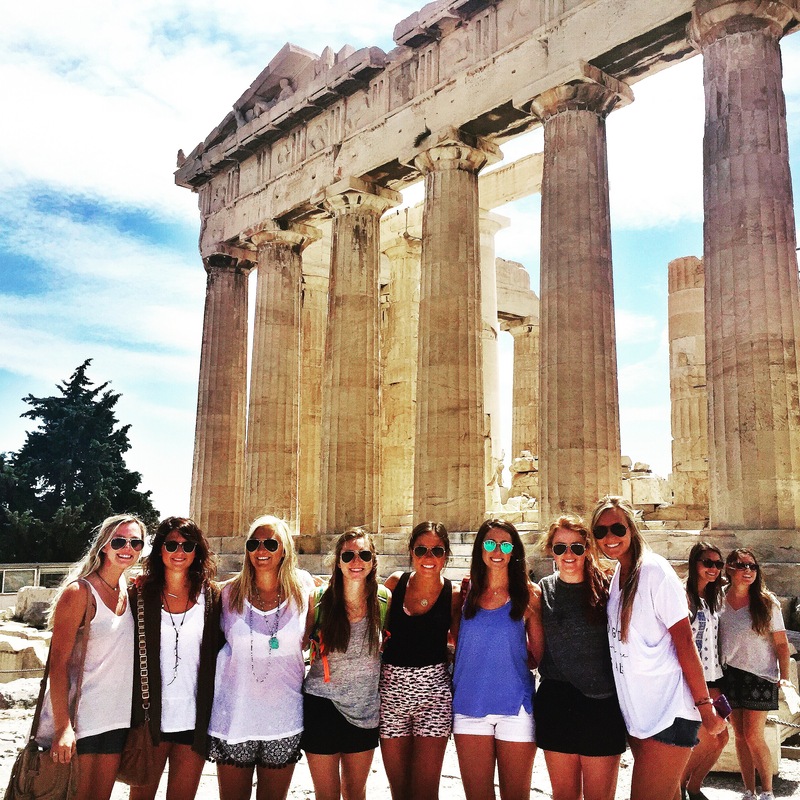 Jeannine Bell, a senior at the University of Tennessee, reflects on her experience visiting the ancient structures of Athens. Check out her blog below! Today my 7th grade ancient civilizations social studies class came alive. It turns out Ms. Eastwood didn’t lie, and out there in the middle of a far, strange land called Athens, Greece, mammoth ancient constructions stand freezing an inconceivable era of history in time. She wasn’t kidding when she talked about that city on a hill. The hike up was a challenge to say the least with slippery marble under my feet, and inclines I usually don’t include in my daily workout, but with each step we made closer to the top, the views became increasingly more breathtaking. The first stop we made on the ascent to the top of the acropolis was the Theatre of Dionysus where I stood in the very place where ancient Athenian rulers sat to be entertained by male actors dressed as women delivering dramatic and comedic story lines, but this was just the beginning. After ascending another 100+ stairs we came to the entrance to the acropolis and witnessed a glimpse of the view that was to come. Standing at the foot of the acropolis I gazed up in awe of what was in front of me only to turn around and see the amazing view of the city of Athens and beyond that was equally breathtaking. It was hard not to stand still in amazement at what I was seeing, but I was assured by others that the view would only get better as we reached the top. Rapidly we approached the peak, and I was in awe of the beautifully constructed antiquity that surrounded me. The Propylaia behind me, the Parthenon and the Erechtheion before me, and Greece’s flag waving in the wind with the breathtaking background of the city of Athens behind I felt I was in sort of ancient dream. Knowing that I was standing where so many people of the past had once stood overwhelmed me. I battled with myself as I flipped between wanting to capture the whole scene in my memory, and wanting to take pictures of every angle to have forever to see at home and to show my friends and family. I soon realized that no picture could ever capture the scene I was witnessing not to mention the overwhelming sense of amazement that didn’t fade for hours to come. Thus, I stood at the edge of the pier over looking the city and flipped between the view of Athens, everything appearing so small as if ants flooded the city, and looking behind me at the grandiosity of the ancient constructions. I have spent so many classes studying ancient civilizations, Greek history, and even an architecture class that covered in detail the construction of the buildings I witnessed at the acropolis. However, what each of those classes did not capture was the incredible feeling of awe I gathered from my day at the acropolis. Seeing the city of Athens dwarfed by such constructions built so high on a hill it felt I could reach up and touch the sky. It all made everything feel so small, and made me realize how little of the world I have actually seen, and how much I now long to see. I have always been mesmerized by history, and have also had a passion for learning the past, not just what occurred, but what was important, how the everyday life was lived, what made the people of the past tick. It’s hard to imagine that those very people struggled with issues I struggle with on a daily basis that are as simple as being hungry, impatient, tired, and confused. It is hard to pinpoint one word to express the emotions I felt during my day at the acropolis. I feel as though I felt every emotion one could possibly feel, and I enjoyed every overwhelming second of all those feelings mixed together. My experience filled me with desire to see the world, every aspect of it, and reminded me of the importance that during my experiences here in Greece its not just about seeing everything, its about experiencing everything, the sites, the smells, the people, everything.